Little photos included, bigger ones if you click on the link underneath. I needed to do something related to motorcycles today. I wanted to attend the Hangtown motocross race that is held just five miles from my house, but didn't really feel like standing in the sun all day to watch the four national races - plus a few others thrown in to fill the time. The alternative was to go riding in the hills and try to find a road or two that I haven't ridden on yet. That's what I decided to do. 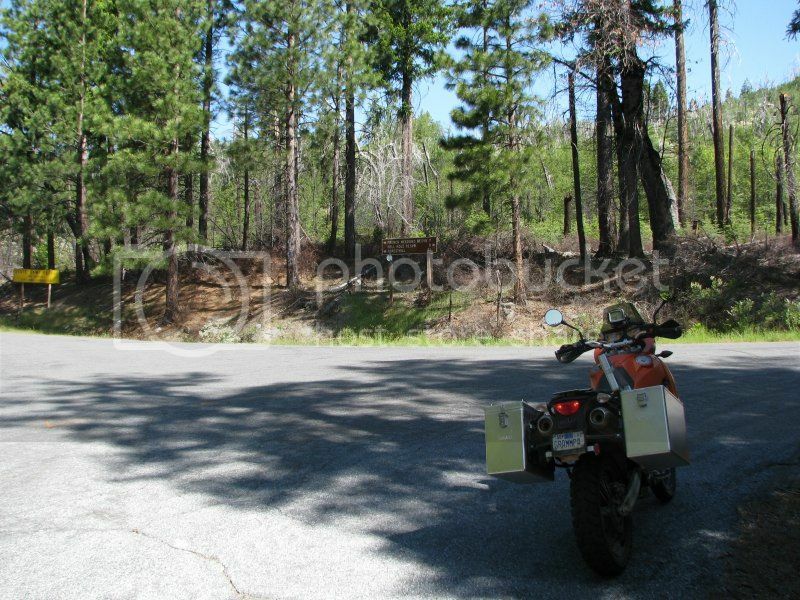 I've been on a few roads around Georgetown (where there is an OHV area) and I've been on a lot of roads around Foresthill (where there is another OHV area), but I've never ridden between the two towns. I had heard that there was a good road between them, so I figured out from Google Maps that I wanted to head east out of Georgetown on Wentworth Springs Rd, find 11 Pines Rd to head to French Meadows Reservoir, then go on roads that I know from there down to Foresthill. Looking at a zoomed out map, I could see that going a few miles out of the way would take me to Hell Hole Reservoir (I don't know who named it), so I was keeping that in mind. I was on track to hit the road a little after 7:30 in the morning, but had left my GPS hooked up to the motorcycle battery a bit too long and the big KTM didn't want to start. I've been having issues with the MSR battery in the KTM, and had even turned one in for a new one a few months ago because it wasn't reliable. It's the "new" one that's giving me problems now. I won't be buying that brand again. Ten minutes on the Battery Tender and I had the the bike running. I still was out on the road before 8:00 am. There are two ways to get to Georgetown, Highway 193 out of Cool or Highway 193 out of Placerville. Since I expected to come back through Cool, I headed to Placerville. I didn't plan the exact route, assuming that I could remember the most direct route to where Highway 193 starts. You would think I would learn from my mistakes since that particular plan never seems to work out. I was good until the end of Green Valley Rd, which starts in Folsom, correctly turned onto Placerville Dr, then totally missed the three roads that would have taken me directly to Highway 49. So I ended up on a little bit of Highway 50 (I usually try to avoid ALL freeways if I can), then got in a traffic jam where a whole lot of cars were going to some sort of event, only wasting maybe 10-15 minutes before I was on the right road again. I was afraid that "everybody" might be headed the same direction as me, but once I got onto Highway 193, I had the road to myself. The road to Georgetown winds down to the bridge that crosses the South Fork of the American River, then winds back up to the top of the hill where it straightens out a bit. I love roads like that. I was a little bit concerned about running low on fuel before making it to the gas station in Georgetown, but the low fuel light didn't go on until about three miles before the town. I filled up there, knowing that there would be no more gas available until Foresthill. You have to remember to top up the tank before heading out into areas like that where there are no towns at all for many miles. I learned that lesson the hard way back in the 80's and have never forgotten it. Wentworth Springs Rd is where you end up if you follow Main Street northeast out of Georgetown. It's one of those wonderful roads through the forest with a 55 mph speed limit on most of it and not too many straight sections. 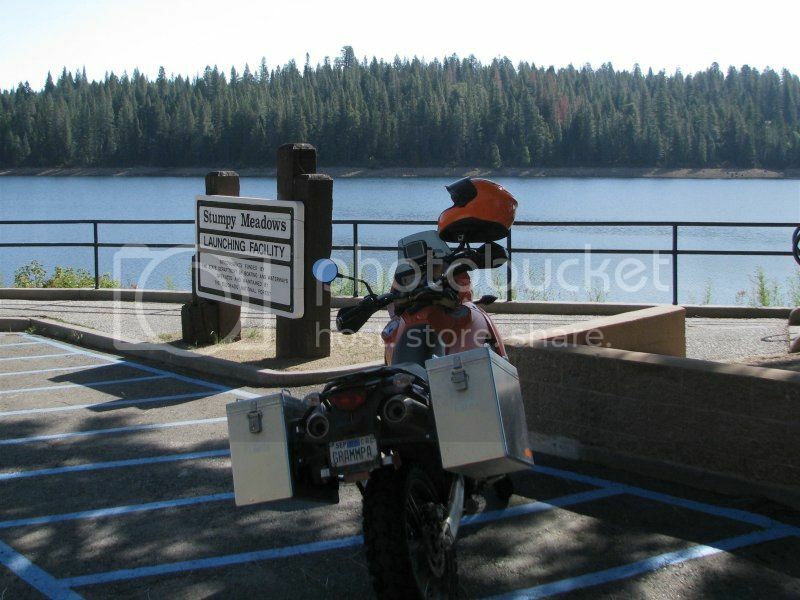 I stopped at Stumpy Meadows Lake to drink a little water, take a few photos, and stretch my legs. I also checked my map while there to make sure I knew about how far to go before I would need to turn left onto 11 Pines Rd. This is when I realized that I had not brought along my AAA map, which would have been the right one for that area. I now keep a small manila envelope with me on all rides in the hills that is supposed to have all maps that I might need. I still had the Butler Map, but it didn't offer as much detail as I would like and definitely was missing point to point mileage that can be so helpful on a AAA map. 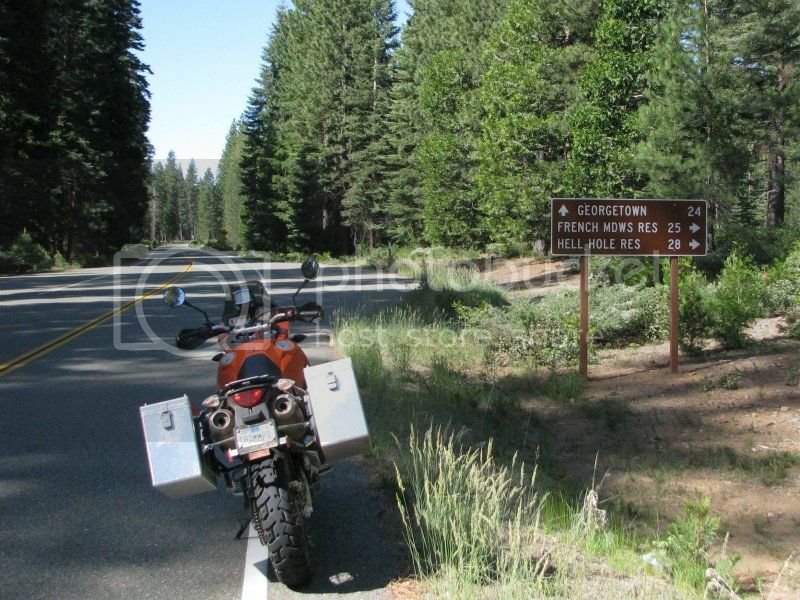 I figured three inches from Georgetown to the lake and one inch to the road I wanted, so ride a few miles then start looking for the sign. When I finally saw a sign indicating a road going to the reservoirs I was interested in, I, of course, passed it and had to turn around. It didn't indicate that the road was 11 Pines. But any big sign with mileage to my destination is good enough even if it is a different road. The road sign on the road itself said NF-2, and that's what my GPS said too. Oh well. It was a narrow, challenging, but interesting road. After a few miles my GPS indicated that I was on 11 Pines, so all was good. Most of these roads through the Sierras work their way down to a point where you can cross a stream, then work their way back up to where it is easier to make roads. I didn't see a single other vehicle on the entire length of 11 Pines. When I finally came to the intersection of Hell Hole Rd and French Meadows Rd, I finally saw an older couple (i.e., anybody who looks older than me) in a Toyota who looked like they were also trying to figure out where they were headed. The sign said 8 miles, so it seemed worthwhile to head out there and back. The road I took is the only paved road to the reservoir. It was also in much worse shape than the other roads I had been on. I had to weave around potholes and broken pavement. Surprisingly, there were more than half a dozen trucks with boat trailers parked near the boat ramp and I could see several boats out on the lake. Heading back out, I followed the sign towards French Meadows and was soon on a road that I recognized. If you go west on French Meadows Rd you end up at Oxbow Reservoir and then Mosquito Ridge Rd. Some of that road is rather steep. 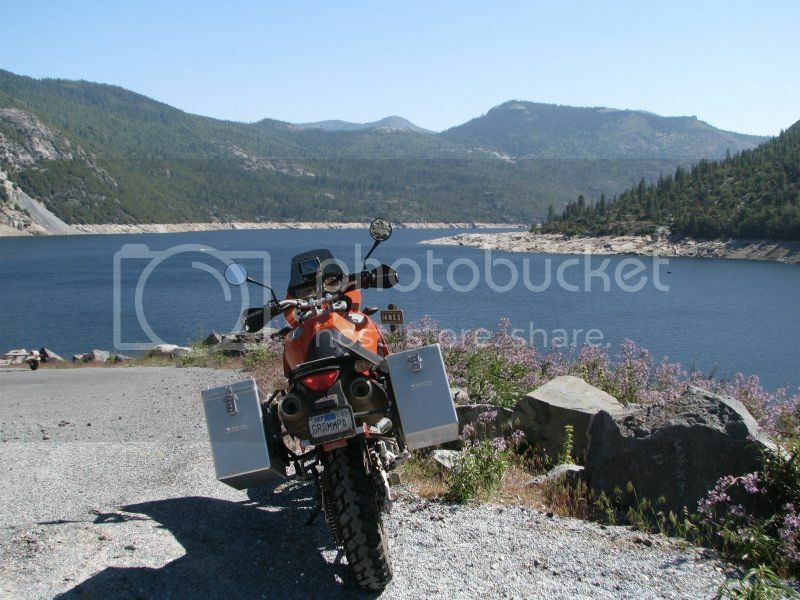 But I was headed the other way and it was fairly flat with gentle turns all the way to the French Meadows Reservoir. 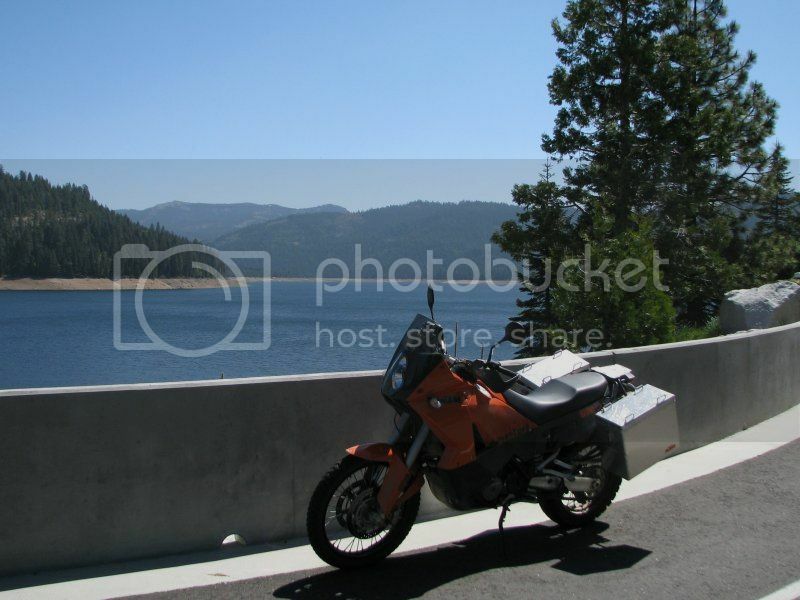 I had planned to take Mosquito Ridge Rd back to Foresthill, a favorite twisty road with the sportbike crowd. But then I remembered that there was a dirt road that comes into the reservoir the back way from the end of Foresthill Rd. I was on the right bike to ride that one, so I headed east. That is one of the advantages of riding alone, you don't have to get agreement on course changes, you just do it. At the end of Foresthill Road is a T-intersection with a sign pointing both ways for French Meadows. I had taken the shorter easier route last year. This longer route was definitely a lot more challenging. I don't think a normal car could have gotten through it without ripping up the bottom of the car and maybe tearing the oil pan off. As it was, I almost got tossed off once when I ran over a rock that pushed the front wheel to the side, leaving me out of control for half a second. 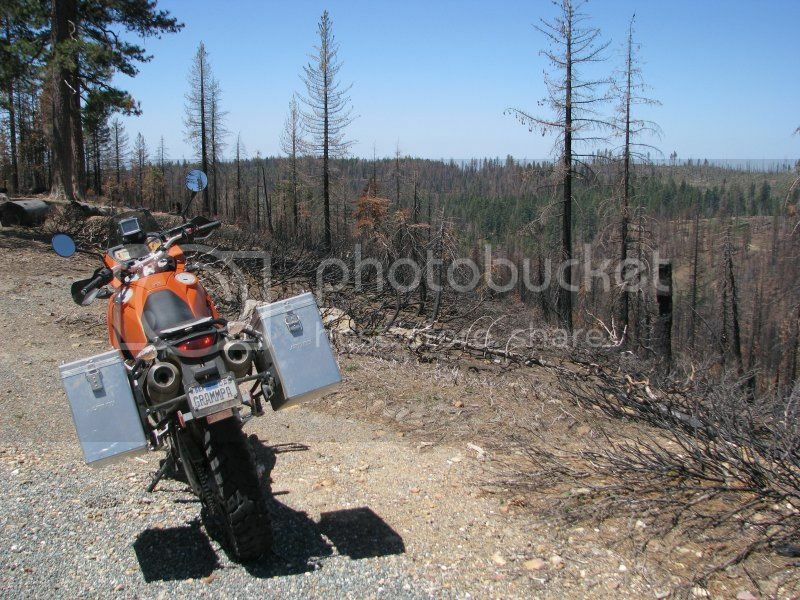 Fortunately motorcycles designed to go in the dirt recover pretty well. The only person I saw on that entire dirt road section was a runner. Once on Foresthill Rd, I was in familiar territory. Except it didn't quite look like the last time I was up there, because there was a big fire at the end of last summer. I guess that's just part of the life of a forest. After 95 miles of riding away from civilization, I made sure to gas up first, then go find some food. The restaurant that I like in Foresthill went out of business a few months ago. At least there is still Worton's Market which has a nice deli and grill inside. The rest of the trip back home was on roads I've ridden a bunch of times - Foresthill to Old Foresthill, down to the river, then Highway 49 through Cool and Salmon Falls Rd back to Folsom. The weather was as close to perfect as it could be for the entire trip - not cold and not hot. The trip was a little under 200 miles and took me a little over six hours. I'll have to do it again with a group of dual sport riders, but we'll find a few dirt roads to substitute for some of the paved ones up in the hills. When I was finally out of the dirt and coming down Foresthill Road, which has no lines on it for quite a few miles up at the far end, I was thinking that when you've been on a road for 20 minutes or more you might start to think that maybe you really are the only one on the road. Apparently the green Toyota truck was thinking the same thing as he came around a corner exactly in the center of the road. Even without him swerving violently to his right when he saw me I would have been able to easily miss him, but I really wasn't expecting anybody to be half-way on my side of the road. Good thing I have a habit of always staying on the right half of the road, no matter how narrow. At least that's my habit on pavement. On the dirt roads I'm looking for the smoothest path through and use the whole road in the rough stuff. But the speeds are slower there, with more time to spot someone coming the other way. Looks like a nice ride. 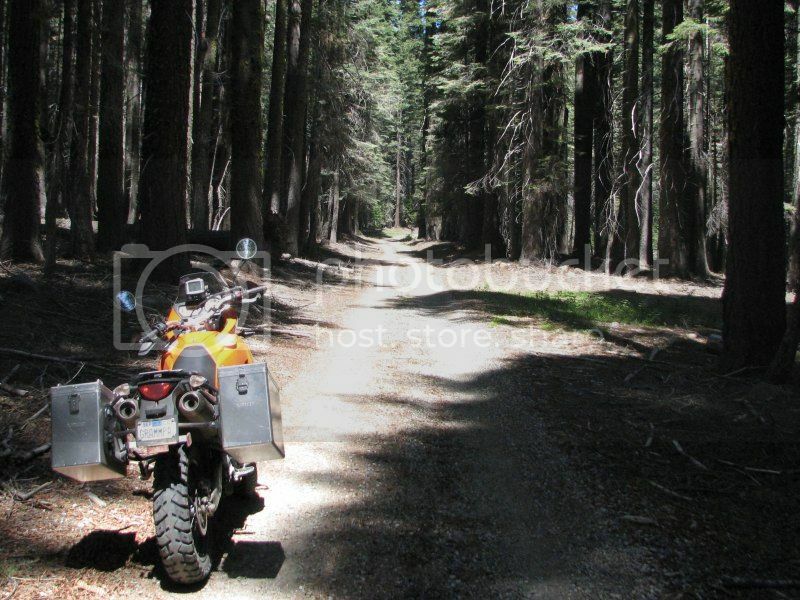 I enjoy dirt roads too, even on my Bandit..lol. That would have made me nervous starting out with a battery needing a charge, especially one that's been an issue in the past. With hard bags, I'd have carried a jump box with me. The one I have is fairly small and light.